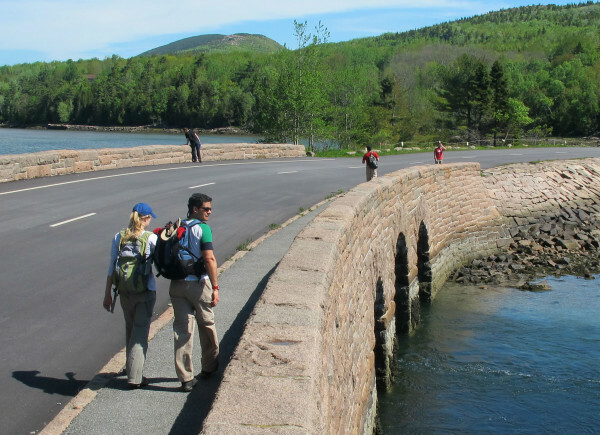 Hikers walk along a causeway on the Park Loop Road that crosses Otter Cover in Acadia National Park in this July 2014 file photo. ACADIA NATIONAL PARK, Maine — A year after a federal government shutdown put a dent in the park’s official visitation numbers, 2014 was the busiest in New England’s only national park since 1999. Acadia officials told the park’s advisory commission on Monday that the park had about 2,563,000 visits in 2014, which represents an increase of more than 300,000 visits since 2013, when the park was officially closed for two weeks because of the impasse over the federal budget. While he offered no explanation for the possible increase, Charlie Jacobi, natural resource specialist for the park, said the increase was not simply a result of the park being open for a full 52 weeks last year. He said tour bus companies that are chartered for cruise ship passengers made fewer trips to the summit of Cadillac Mountain last year than they did in 2013, when the shutdown closed the park during peak fall foliage season. “It wasn’t just [the two-week closure in 2013] that caused this large increase,” Jacobi said. Park officials estimate that only 2.25 million people visited the park in 2013. It was the lowest annual estimate for the park since 2009, when Acadia staff calculated that they had 2.22 million visitors. In 1999, 2.6 million people were estimated to have visited Acadia, including people who made repeat visits over the course of the year. More than 2.5 million people visited the park in 2001, 2002 and 2010, with annual numbers fluctuating between 2 million and 2.46 million in other years in the past decade and a half. Acadia’s visitation numbers are estimated every year because of the logistical hurdles in counting the number of people that enter the park through myriad entry points, some of which simply are roads that pass through the park between the villages on Mount Desert Island. But park officials said that, even if not every visitor gets counted, the methodology has been the same for 25 years so the increases or decreases in the annual estimate do reflect whether more or fewer people have visited Acadia. “The trend is what we look at,” Acadia National Park Superintendent Sheridan Steele told the commission. The Island Explorer bus system also had a banner year in 2014, park officials told the commission. For the first time ever, the fare-free seasonal transportation system had more than half a million passengers for the year. The propane powered buses, operated by Downeast Transportation, operate each year on MDI from late June through the end of October. The Island Explorer system, which was started in 1999, passed the 5 million passenger threshold this past summer, according to John Kelly, Acadia’s park planner. He said the Island Explorer usage in 2014 was 15 percent higher than 2012, when there was no shutdown that affected the bus system’s operations. Acadia staff also told the commission that they have been trying to learn more about transportation issues in the park and about a tiny invasive insect found on MDI called red pine scale. The park hopes in coming years to develop or update plans for managing transportation inside its boundaries — which would include the use of bikes, buses and private vehicles and the availability of parking — and for taking action to protect red pine trees from the damaging bug, staff said.